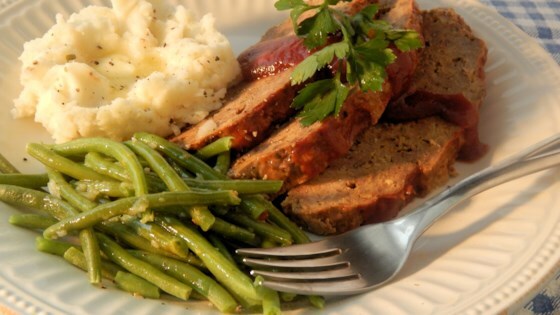 "This slow cooker meatloaf is lower in fat and cholesterol because you use 1/2 ground round and 1/2 ground turkey breast. This meatloaf will be moist, but not as greasy as other recipes for a slow cooker. May have some for leftovers, too!" Grease a slow cooker with cooking spray. Combine ground round and turkey in a bowl; mix until fully combined. Stir in bread crumbs, soup mix, parsley flakes, black pepper, and garlic powder. Add eggs, 1/4 cup ketchup, and mustard; mix well. Form meat mixture into a loaf. Place in the slow cooker. Cook on High until no longer pink in the center, about 6 hours. An instant-read thermometer inserted into the center should read at least 160 degrees F (70 degrees C). Mix 3 tablespoons ketchup and brown sugar together in a small bowl to make the glaze. Spread over the meatloaf; continue cooking until glaze is set, about 1 hour more. If meatloaf is browning too quickly, turn the slow cooker setting to Low for 1 additional hour after applying the glaze. Husband loved it. I used 2 lb ground round and 1 lb ground turkey. Did not use the glaze, but will try next time. My husband loved this and ate it for 3 meals! Very delicious! Love this recipe. It came out moist and flavourful. Easy and yummy. I didnt have the full amount of the beef so mine was half beef and half turkey... still came out great. Not greasy and tastes wonderful cold in meatloaf sandwiches.